If you’re planning to apply for an internet connection at home, now is the best time to apply for a new broadband plan with Globe Telecom. They have the latest DSL plan offer that will surely fit your need for only 1299 pesos monthly plus entertainment data freebie included. The new Globe Go Big Home broadband plan 1299 gives you 400GB of monthly data allocation that is four times more bandwidth than their previous DSL Plans. With the 400GB monthly internet data, the 100MB is dedicated only for YouTube streaming. That is 150 hours estimated playing your favorite video in standard definition. You can use the 300GB to access your social media accounts, streaming music, send and receive email, downloading videos, online gaming and more. Another good thing when you apply for the new Globe at Home internet plan 1299 is that you can try out the new no lock-in period trial pack Plan 499. 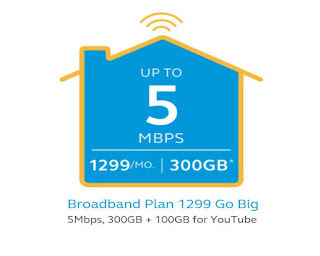 With 499.00 pesos, you can enjoy up to 50Mbps and up to 600GB of data monthly up to (3) months. After the trial period you can decide to discontinue or maintain the selected plan, but this time the bundle will be in line with the Go Big plan package. You can visit your nearest Globe store for availability of this service on your location or call their hotline for more queries and detailed information about Go Big Broadband Plan 1299. The DSL installation fee is 1,000.00 pesos that is payable in months. Please note that this plan is subject to Globe at Home’s availability in specific area.